"Until I received this recipe, I never could master the art of meringue. Now I can whip it up perfect every time." In a large glass or metal mixing bowl, combine egg whites, vanilla and lemon extract. Beat until foamy. Gradually add white sugar, continuing to beat until stiff peaks form. Spread meringue over pie, covering completely. To bake: Preheat oven to 350 degrees F (175 degrees C.) Bake pie in the preheated oven for 10 to 15 minutes, or until golden brown. You’ll be amazed how easy it is to make homemade frosting. 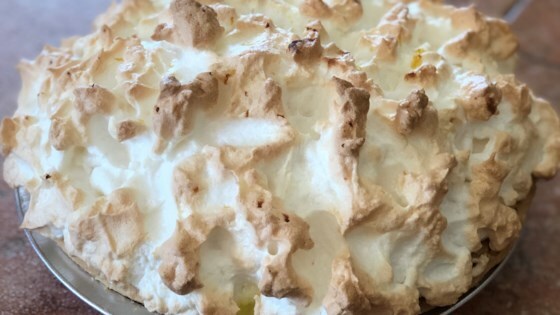 This is a good standard meringue. You can add 1/4 teaspoon of cream of tartar to help stabilize the meringue if you like. These did not turn out at all. THis was THE worst meringue ever. Don't even waste your time. This was a very easy recipe, tastes delicious and it came out perfectly. The only thing I omitted was lemon extract because I didn’t have it in the house. I didn’t have lemon extract, but it sounds good. The trick with meringue is to have a dry bowl and beaters, and to not overbeat it. Worked for me. So easy and taste great!